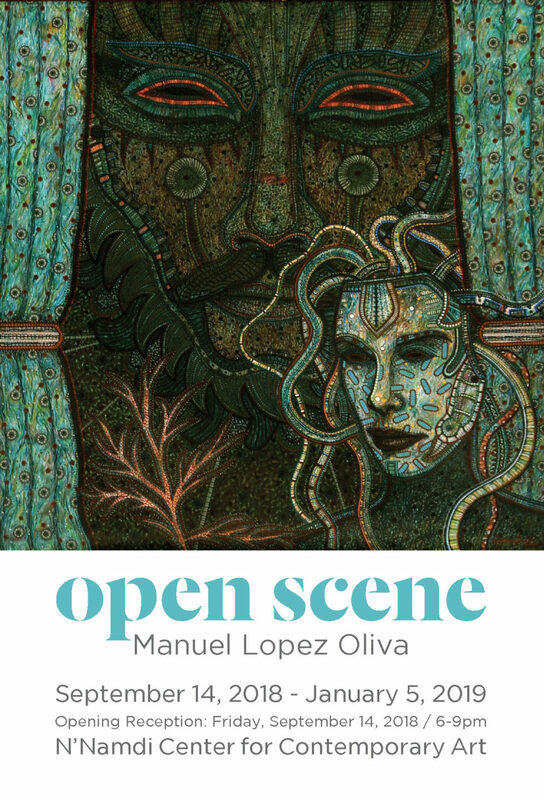 Manuel Lopez Oliva is one of the active painters most recognized and authentic of Cuban art. There is a particular mixture in his art between meaning and the visual structure. Theater expressions and masquerade form part of his artistic language. The artist sees the theatre play beyond the “art of acting” and the very stage. For him the theatre exists in carnival too, in rituals and ceremonies where mask become a real face. This way, he establishes a link between spectator and symbol, but he makes life become an animated representation of its sentry, as well as the ancient legends which govern the human behavior. The N’Namdi Center for Contemporary Art presents diverse, multi-disciplinary and engaging art experiences. It serves to promote and perpetuate the cultural legacy of African-American and African diasporic art, along with art from diverse cultures. Since its conception in 2010, the N’Namdi Center has contributed to the Detroit arts scene by presenting art exhibitions by nationally and internationally renowned artists as well as local and emerging talent. The N’Namdi Center’s work is based on two core beliefs: that the arts can play an integral role in the revitalization of Detroit, and that a thriving creative community depends upon the participation of a diverse group of artists, organizations and individuals. The N’Namdi Center builds on these beliefs by acting as a catalyst in the development of Detroit’s creative ecosystem, with a continuing focus on African American art and community engagement through the arts.